Aaron Taylor. Photo courtesy of Stantec. A Showcase to the world not just to the U.K. So when we won the project we were tasked to not only celebrate the best of Canada and its arts and materials, furniture and what not, but also to recreate that bond that the High Commission should have with the centre of London. By their very nature, High Commission buildings are secure and can be quite introverted in terms of how they represent themselves and how they work within their context. But here, the High Commission had a unique opportunity because it is on a world square giving it a fabulous opportunity to advertise Canada, not only to the U.K. population but all those who come and spend time in Trafalgar Square. You touched on the heritage aspect. Developing a heritage building in the centre of London has challenges. We have a very strong heritage body in the U.K. – English Heritage – with whom we worked closely along with the [London] planning authorities. We brought them on very early because that is the only way to get effective dialogue and to ensure they work as part of the design team. We had early meetings with them to identify and test concepts to determine what structural changes were non-starters. We really ended up with a blend and a palette of materials with which they were happy as well as a suite of work that restored those key areas that had been damaged or left to go into disrepair over the years. These interventions really celebrate the best of the heritage elements but allowed us to introduce some more contemporary features. 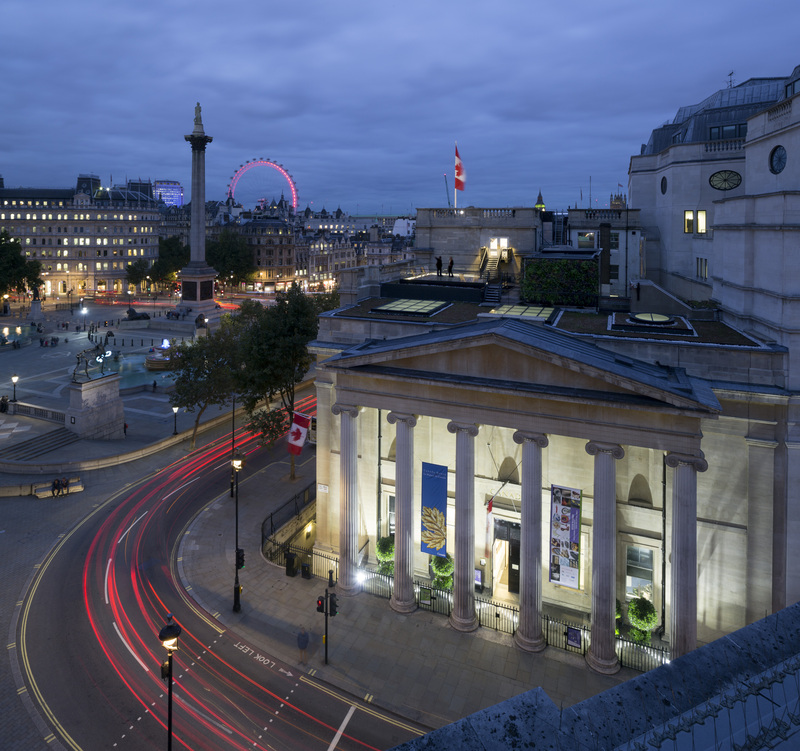 Trafalgar Square’s historic structures include (left to right): Canada House, Nelson’s Column and The National Gallery. Photo by Ben Blossom. We restored the ground floor, which had always been the main entrance, as well as the grand rooms for Canada House like the McKenzie King room and the other celebration rooms and the original grand staircase, now with the Bocci light feature hanging through its middle. As you go up [to the upper floors] you get into rooms of lessor importance in terms of heritage and where we could get into interior design through structural alterations to create more contemporary spaces. The Trade Office, which sits more on the left-hand side as you look at the building, is a double height restored space that was originally the College of Physicians library years ago. It had been a very ornate, double-height space that was filled in the 1970s with a fairly grotesque 1970’s magnolia colour scheme everywhere and poor stand ceilings. So, we worked with English Heritage to take it back to its original state as well as to record and protect those elements in the original structure. There wasn’t much of [this structure, however] because it had been destroyed. In the end we interlaced the original design with new proposals to come up with something that is a contemporary space. Interestingly, [the Library] was a space you could see from Trafalgar Square but it suggested a very dark and bleak building. There was no activity [thus] one of the things the project has been able to do is enliven the building again and increase the sense of activity behind the façade. You can now catch key glimpses of art and design from Canada in terms of lighting, in terms of its paintings; but, you can also look through the glazing and see back up into the double height space. It gives you a very different view of what is a very important heritage site. The heritage bodies have been very pleased with how it has turned out and are delighted with the balance between the contemporary and the heritage. The challenge was introducing elements of Canadian art. We have been very careful about where we have introduced art into the spaces, incorporating works even into the design of the freezes and the design of the mouldings around the walls. We had taken squeezes of the [remaining heritage] mouldings to reproduce new ones and we designed their framing on the walls to complement the proportions of the pieces of art that have gone into these rooms. 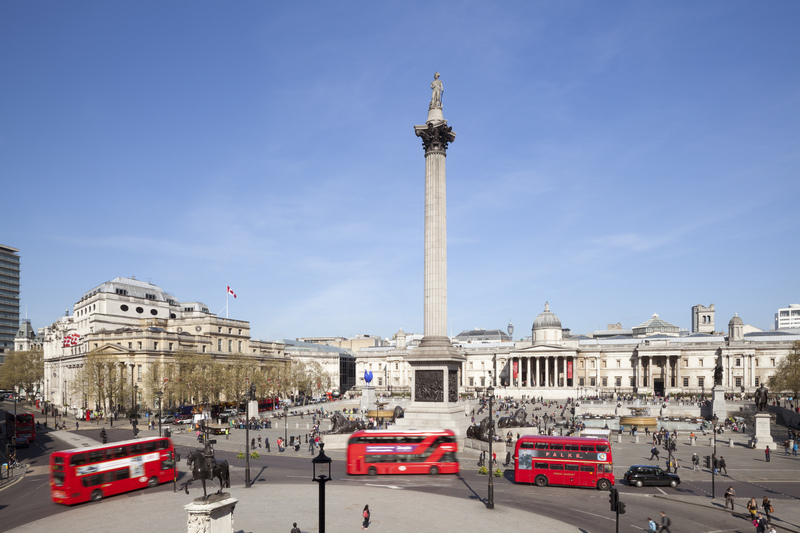 One of Gordon’s main drivers was to reengage and reinforce the entrance on Trafalgar Square. Now the main doors to Trafalgar Square are open and people can come in and experience the [grand main entrance spaces] of the building. For a long time the only entrance to Canada House, unless there was a very significant event, was from the Pall Mall side entrance into a rather mundane gallery space. That space has now been transformed [into an actual gallery] that is a much warmer space with a lot of use of wood. Rolling programs of Canadian contemporary artists have been exhibiting there since the building reopened. One of the major pieces we had to undertake was the recreation of the top floor of the building. The Laurier room, which is the top room of Canada House, is the main entertainment room for the High Commissioner. That has been completely renovated. There is a new floor, a new [coffered] ceiling and we have completely transformed the [adjacent] roof garden. This new terrace is newly created on what had been a very antiquated roof structure that contained all the [HVAC] plant. It was a bit of an eyesore looking across from the square. One of the things on which we worked very closely with English Heritage and the planners was to realize the High Commissioner’s desire to use this roof space. Many of the adjacent buildings look down on this roof and it is a common problem for all our cities that you have to think about the roof as a fifth elevation. We were adamant that it had to be transformed and it had to have a green-planted wall that went around the [HVAC] plant room. When planting the green wall, we sourced Canadian plants that could exist in London’s climate. Again, this wall can be seen from across the square and helps to reinforce the vibrant contemporary image of Canada House. It is an interesting juxtaposition of heritage and a green wall. The timber decking is cedar, Canadian wood being a common thread across the whole project. One important aspect of the terrace is that even the detailing of the handrails has been worked through with the heritage people. These rails take their profile from the original interior handrails. So the heritage element has been carried all the way through. 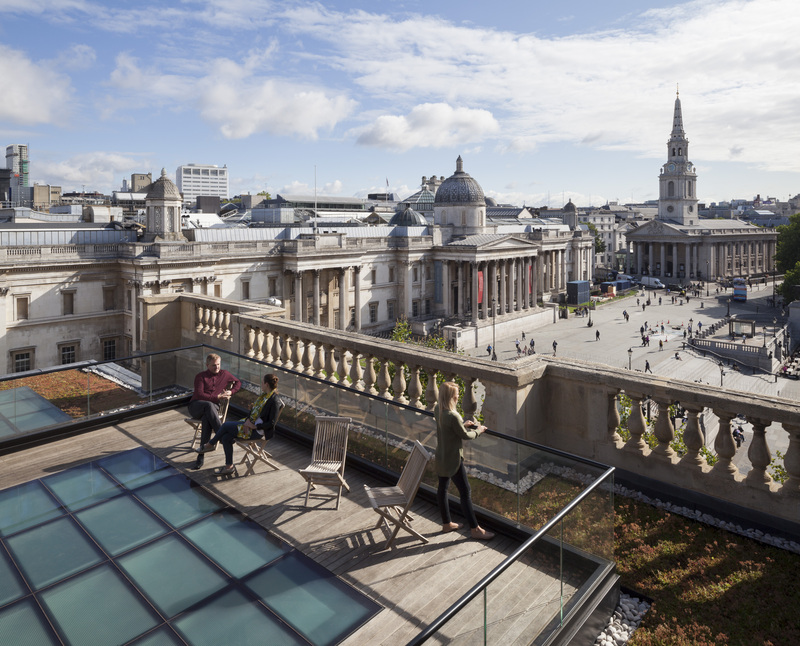 A newly created outdoor terrace on the roof includes both a green roof and a green wall, and arguably one of the best views of Central London. Photo by Ben Blossom. The new flooring that has been installed throughout Canada House is from Canadian timber. [In addition to the terrace and much of the interior flooring], Canadian hemlock is used on the walls in Cockspur. One of the drivers that the High Commissioner wanted early on was, as Canada was the world’s largest exporter of lumber, that there had to be timber used at every opportunity. Even the more mundane workplace areas have timber ceilings and of course, the timber goes up through the main, cascading [Queen Elizabeth] atrium. The Queen Elizabeth atrium stair is designed so that as you move up through the space. It is a tight atrium without a lot of daylight [and] is structured so that you get as much natural light penetrating to the base of that atrium as possible. The staircase came in as a kit of parts through a second storey window and assembled inside, all the while allowing the tenants on the top two floor to continue working. They continued in their space while we were virtually knocking hell out of the building from the basement to the third floor. The biggest challenge from a heritage point of view was how we linked the original Canada House with the Cockspur building in behind. There are three linkage points, one being a secure basement opening for services. There is one on the ground floor and one on the second floor of the original Canada House but [the latter] connects to the third floor of Cockspur St. They are not really to facilitate a lot of public flow but to make the two buildings work as one. While the vast majority of the Commission staff work in Cockspur, the linkages serve to make the flow between the spaces as seamless as possible. They are fairly minor in their aspects, they are not overly grand; but they deal with the fact that we have created a link between walls that are over a metre thick with very limited information on structure. One of the main drivers was to celebrate art, architecture and materiality from Canada. So, when we identified the key meeting rooms and the key spaces in the building, every province and territory was allocated a meeting room all done very democratically [with size allocated based on population]. As part of [the design process] we ran a competitive process for artists from each of these regions to develop design concept for the carpets. With the High Commissioner and a couple of others, we selected the winning artists from each of these regions and then they were worked up [as carpets]. There is some incredible imagery in these works that are both handmade and often enormous in size. They were each very much designed with the individual spaces in mind. The carpet in the MacDonald Room, for example, measures 20 metres long. While they handmade some of them in Canada, because of the sheer volume and the timeframes involved, some were made in [Singapore and Turkey]. The carpets were the precursors and the drivers for the colours and much of the other elements that went into this building and its rooms in terms of the palette of colours, the wall finishes and the furniture selection. [Finally], almost all the furniture and furnishings are Canadian. They are either bespoke or off the shelf from Canadian firms such as Nienkamper. Canada House has been Canada’s diplomatic home in the United Kingdom since 1925. Photo by Ben Blossom. [As the design team] we spent considerable time working with Dan Sharp [Department of Foreign Affairs now named Global Affairs’ curator] and the high Commissioner to identify each of the spaces [requiring] a piece of art and then to understand what was the design impact of the [selected] carpets and to understand what was the context of the rooms. We spent a huge amount of time matching up the moldings on the wall, etc. and then identifying the art pieces that would complement the dimensions, the colours and the tones. They were then mocked up in photo-realistic graphics. It was anything but a case of just seeing what was in the vaults and plunking an available piece wherever. There is a reason behind every piece and where it is placed. At the public [business] entrance on Cockspur St. where Canadian citizens come for services or where other people come to get visas, you are greeted by a wonderful piece painted by Gordon Smith. One of the wonderful things [about this piece and its placement] is that when you go past that building in the evening and they have not closed the big bronze doors you see the Gordon Smith and you go like “wow!” It reinforces the point we were talking about earlier, about trying to celebrate the Canadian element on Trafalgar Square. It really helps to strengthen the relationship between the street and the Canadian High Commission that exists behind the walls. It’s fair to say that every piece of loose furniture or lighting or carpet have all been specifically influenced by every one of our offices across Canada. I went to every province and territory where we at Stantec also have offices and spoke to each of our interior people about what are the best products coming out of [their region] in terms of lighting or furniture. We believe we have sourced the best and most contemporary products from right across Canada. What I think Canada House has really delivered on is creating a space that is immediately recognizable for all those that are passing it in central London. But, it has also delivered a space that speaks to the members of staff who work there as well as those who use the building as an event space. It delivers a space that really helps to strengthen design excellence. It is delivering on the original brief to celebrate Canada. From a design point of view, how it has succeeded in taking an unloved building back and restoring it should be of immense pride to Canada as a whole.